Hello blogging world! It has been a long long long long looooooong time since I’ve posted. For that, I am truly sorry. I have a decent (sort-of) acceptable excuse though. This year has been, for lack of a better phrase, complete crap. Divorce, loss of a job, moving out of my beloved city, heartbreak, etc., etc…I needed to take a mental break. BUT, in the uplifting, wise words of Jason Mraz: things are looking up, I know above the clouds the sun is shining! And I’m ready to jump back on the blogging bandwagon! Needless to say, I am ready to see 2014 come to an end and in the spirit of compassion and positivity I compiled a Vegan Holiday Gift Guide. Beautiful and thoughtful gifts in a variety of price points for the vegan in your life. I realize the holidays are about being with loved ones, and I personally would rather just spend quality time with my friends and family than focus on gifts, but sometimes it feels good to give someone you love something thoughtful and special. So I hope this list helps you on your quest! This tea is brewed specifically to pair with your favorite alcohol for a simple cocktail that tastes anything but. I fell in love with this company at Natural Products Expo earlier this year (y’all know I’m a sucker for cocktails). They have all three of their flavors (which include pairing suggestions) in this great little gift pack ($22.99). This is the perfect hostess gift or present for the tea/cocktail-loving people in your life. Click here to find out where Owl’s Brew is sold near you. The phrase “Pura Vida” (pu·ra vi·da) means “pure life” in Spanish. 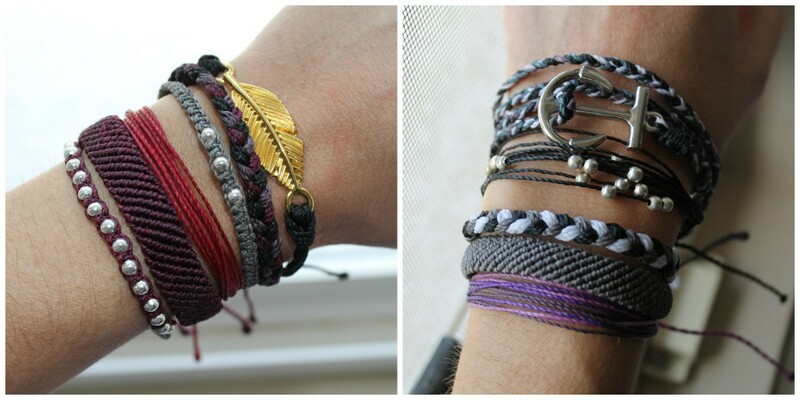 These unisex wax-coated string bracelets come in a variety of colors and styles. They are perfect for mixing and matching but if you don’t trust your own judgement you can buy one of their predesigned style packs. The best part about this company is they provide jobs for local artisans in Costa Rica and give back to many charities. Grab a few for the do-gooders on your list! 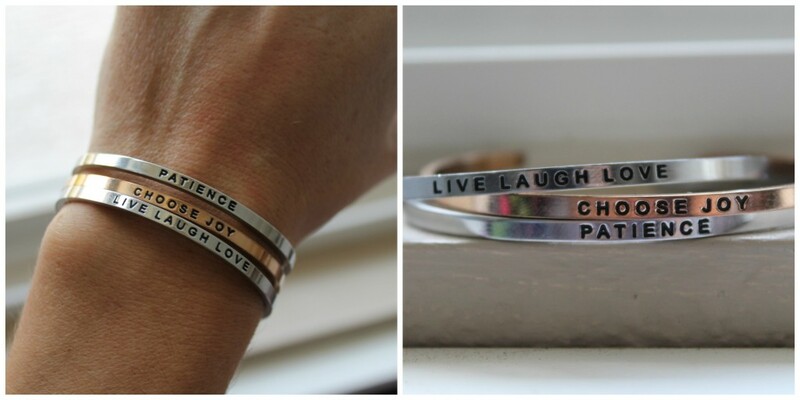 I discovered these beautiful cuff bracelets at a time in my life where I was in desperate need of daily mantras. The messages of love and positivity are so uplifting and they are stylish enough to go with any outfit. There are over 50 unique mantras stamped onto lead free stainless steel. You can also opt for gold or rose gold plated steel. They offer gift cards as well if you want to let the receiver choose their own mantra. 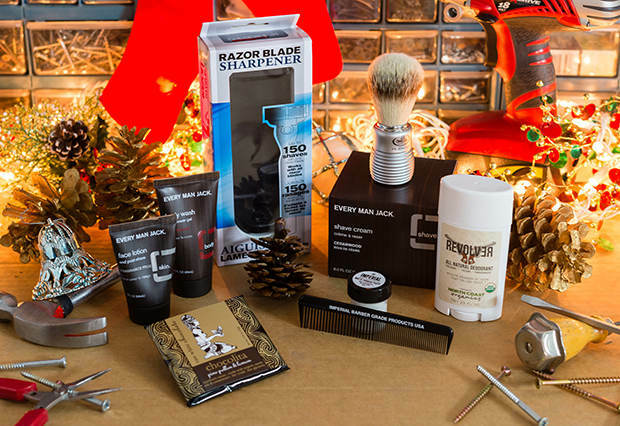 For the manly man (who also happens to be awesomely compassionate) in your life – consider giving him this grooming kit featuring 9 luscious products including shaving brush, shaving cream, pomade and more! No having to read product labels to make sure everything is vegan and cruelty-free, Vegan Cuts has done all the work for you! You can also sign up for monthly Snack Box or Beauty Box subscriptions from Vegan Cuts as well – the gift that keeps on giving month after month! If you’re looking to splurge on your sweetie this holiday season consider a luxury cruelty-free designer coat from Vaute Couture. They carry styles for men and women. 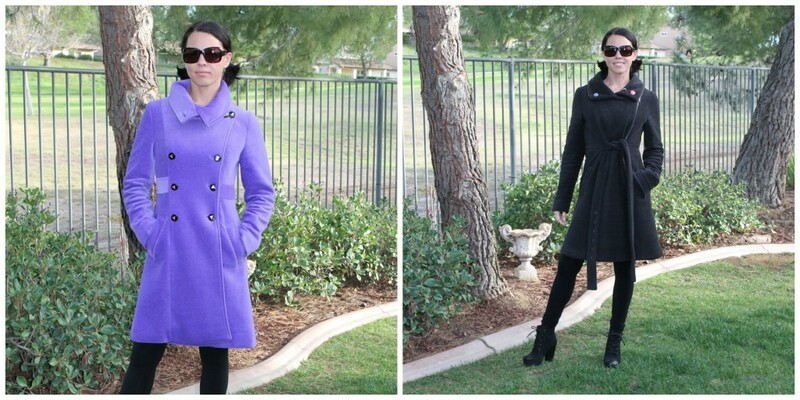 I happen to own two VC coats (and some tanks, a sassy dress and comfy scarf…what can I say? I LOVE this company) and they are beautifully made and so incredibly warm. I took one to Canada last winter and it kept me super toasty, plus I get a gazillion compliments from people on how gorgeous they are. If you want to give the gift of VC but have budget constraints, opt for one of their many adorable tees in the shop! Know someone (or perhaps that perfect couple) who love having movie nights at home? 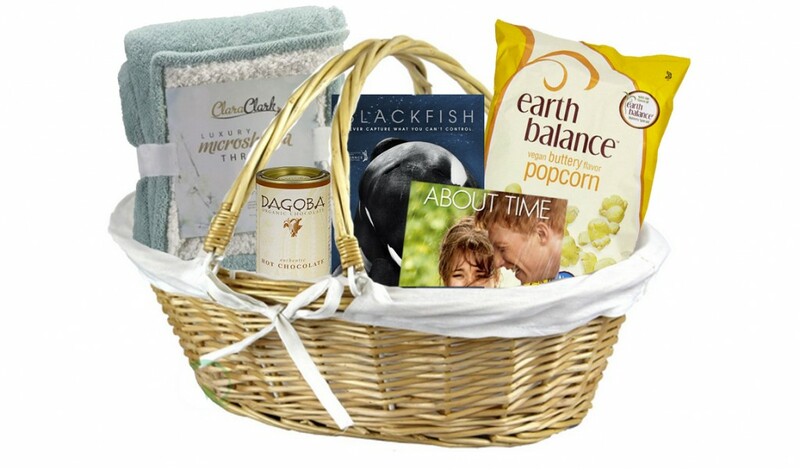 Put together a movie lovers basket featuring a throw blanket , vegan Hot Chocolate mix, Popcorn , and a DVD or two (there are some AMAZING documentaries out there for your compassionate pals like Blackfish , The Ghosts in Our Machine, Forks Over Knives , etc. – but a RomCom never hurt anyone either!) Put it all in a pretty basket that they can reuse or upcycle and you’ve earned yourself a huge gold star in the gifter world. Women love purses (well, at least I know I do) and it’s wonderful to have a vegan designer handbag company like Susan Nichole to fill the need without the cruelty. These babies are made with vegan leather and they are gorgeous and sturdy. I’m personally eyeing the Wendy in Black pictured below along with Kendra in Cranberry and Emily in Pewter. If you act fast, you can still get in on Cyber Monday deals going on now! Sometimes the best gifts aren’t tangible. By making a donation in someone’s name you are helping organizations that are out there fighting the good fight everyday and it makes everyone involved feel all warm and fuzzy. You can find out your loved one’s favorite charity on the sly, or introduce them to a new one you know they’d love to support. 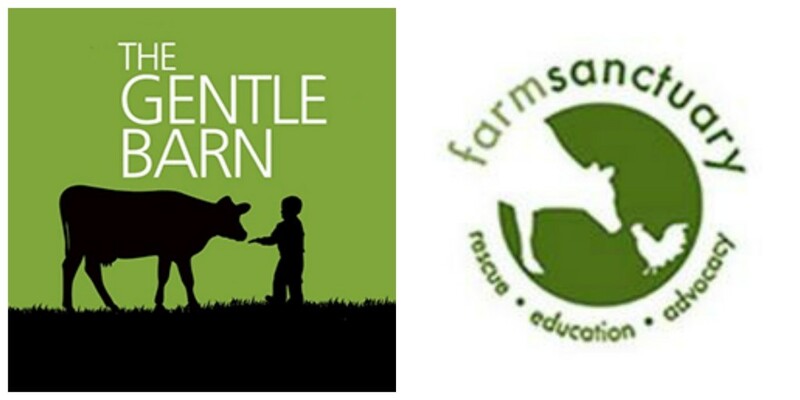 Even $10 can go a long way, especially for places like the The Gentle Barn and Farm Sanctuary. Well, that’s it folks! I hope this guide gives you some ideas for those fun-loving vegans on your gift list! I’d love to hear some of your gift ideas or what you’re wishing for this year in the comments below!